Genomic alterations of the proto-oncogene c-erbB-2 (HER-2/neu) are associated with aggressive behavior and poor prognosis in patients with breast cancer. The variable clinical outcomes seen in patients with similar HER2 status, given similar treatments, suggests that the effects of amplification of HER2 can be influenced by other genetic changes. To assess the broader genomic implications of structural changes at the HER2 locus, we investigated relationships between genomic instability and HER2 status in patients with invasive breast cancer. HER2 status was determined using the PathVysion® assay. DNA was extracted after laser microdissection from the 181 paraffin-embedded HER2 amplified (n = 39) or HER2 negative (n = 142) tumor specimens with sufficient tumor available to perform molecular analysis. Allelic imbalance (AI) was assessed using a panel of microsatellite markers representing 26 chromosomal regions commonly altered in breast cancer. Student t-tests and partial correlations were used to investigate relationships between genomic instability and HER2 status. The frequency of AI was significantly higher (P < 0.005) in HER2 amplified (27%) compared to HER2 negative tumors (19%). Samples with HER2 amplification showed significantly higher levels of AI (P < 0.05) at chromosomes 11q23, 16q22-q24 and 18q21. Partial correlations including ER status and tumor grade supported associations between HER2 status and alterations at 11q13.1, 16q22-q24 and 18q21. The poor prognosis associated with HER2 amplification may be attributed to global genomic instability as cells with high frequencies of chromosomal alterations have been associated with increased cellular proliferation and aggressive behavior. In addition, high levels of DNA damage may render tumor cells refractory to treatment. In addition, specific alterations at chromosomes 11q13, 16q22-q24, and 18q21, all of which have been associated with aggressive tumor behavior, may serve as genetic modifiers to HER2 amplification. These data not only improve our understanding of HER in breast pathogenesis but may allow more accurate risk profiles and better treatment options to be developed. The HER2 (c-erb-B2, HER-2/neu) gene, located on chromosome 17q12, is a member of the epidermal growth factor receptor family with tyrosine kinase activity . Amplification of the HER2 gene and/or over-expression of the corresponding protein have been detected in 15–25% of human breast cancers and is associated with poor prognosis [2, 3]. Under current standards of clinical care, patients with HER2 amplified (HER2+) tumors receive trastuzumab in combination with standard chemotherapy , however, despite treatment with trastuzumab, many HER2+ patients develop distant and progressive metastatic disease [5, 6]. To develop more effective treatments for patients with HER2+ breast tumors, efforts have focused on the identification of genes that modify clinical response to trastuzumab including cyclin-dependent kinase inhibitor 1B (p27), phosphatase and tensin homolog (PTEN), insulin-like growth factor 1 receptor (IGF1R) and topoisomerase II α (TOP2A) [7–11]. In addition, efforts to characterize molecular changes associated with HER2 amplification revealed a cluster of genes from the 17q12-q21 region with similar patterns of amplification, and concordant changes in gene expression [12–14]. Furthermore, multiple gene expression analyses have defined molecular signatures for breast tumors with varying pathological characteristics [13, 15, 16], improving the ability to accurately characterize tumor sub-types. Despite advances in molecular characterization of HER2+ breast tumors, mechanisms by which HER2 amplification contributes to breast cancer pathogenesis remain unknown. In this study, we examined levels and patterns of allelic imbalance (AI) in primary breast tumors with and without HER2 gene amplification to 1) examine associations between amplification of the HER2 gene and global genomic instability and 2) identify chromosomal changes commonly observed in HER2 amplified tumors. Paraffin-embedded primary breast tumors were obtained from the Windber Medical Center Pathology Department or the Clinical Breast Care Project (CBCP) Pathology Laboratory. Samples from patients with a previous history of breast cancer or who had received neoadjuvant therapy were excluded from this study. Samples from the Windber Medical Center were archival in nature, having been diagnosed between 1991 and 2003; clinical information was provided for these de-identified samples by the Memorial Medical Center Cancer Registry. Tissue and blood samples from CBCP patients were collected between 2001 and 2006 with approval from the Walter Reed Army Medical Center Human Use Committee and Institutional Review Board. All subjects enrolled in the CBCP voluntarily agreed to participate and gave written informed consent. Clinical information was collected for all CBCP samples using questionnaires designed by and administered under the auspices of the CBCP. To ensure consistency, diagnosis of all tumor samples were made by one pathologist from hemotoxylin and eosin (H&E) stained slides; staging was performed using guidelines defined by the AJCC Cancer Staging Manual sixth edition [17, 18]. HER2 status was assayed using the PathVysion® HER-2 DNA Probe kit (Abbott Laboratories, Downers Grove, IL). Amplification was defined as a HER2:CEP 17 signal ratio of ≥ 2.2 . Patients with either equivocal HER2 status (1.8 – 2.2) or aneusomy were not evaluated in this study. Clinicopathological information for all samples is summarized in Table 1.
aP-values calculated for HER2 positive versus negative tumors. bComparison between well- and poorly-differentiated tumors. cComparison between hormone receptor negative (ER-/PR-) and hormone receptor positive tumors. dComparison between 0+/1+ and 2+/3+. 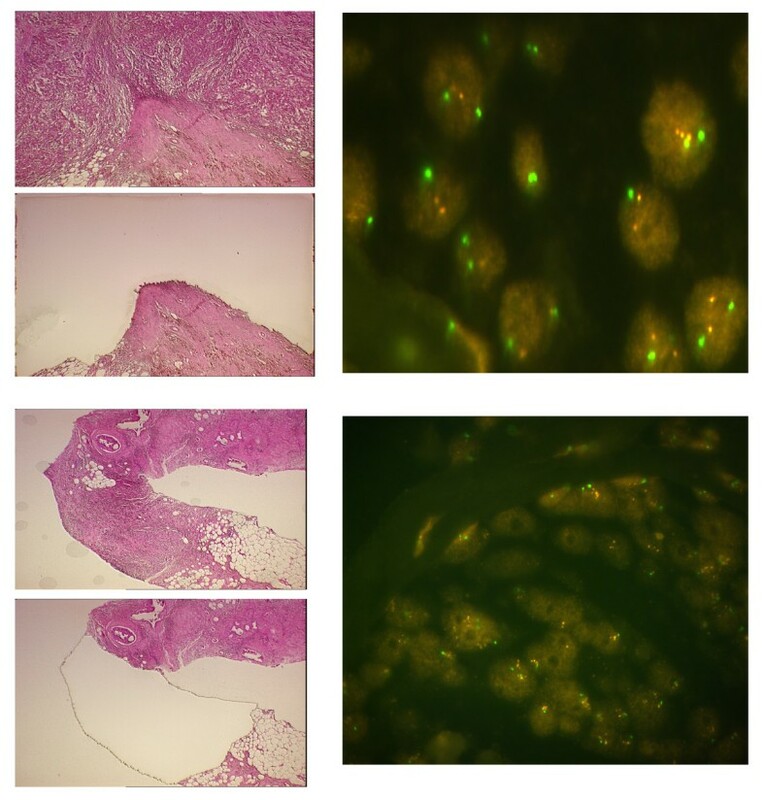 DNA was obtained from pure populations of primary breast tumor cells following laser-assisted microdissection on an AS LMD laser microdissection system (Leica Microsystems, Wetzlar, Germany)  (Figure 1). All microdissected sections were examined by the CBCP pathologist, who identified and marked regions of tumor before dissection. To avoid PCR artifacts, ≥ 5,000 cells were captured from each of six consecutive breast tumor sections, with the sixth section reserved for all confirmatory reruns. Referent DNA samples for the archival samples were extracted from disease-free skin or negative lymph node tissue from each patient using the QIAamp DNA Mini Kit (Qiagen, Valencia, CA). Referent DNA for the CBCP samples was obtained from blood clots using Clotspin and Puregene DNA purification kits (Gentra, Minneapolis, MN). Images of tumors before and after laser-assisted microdissection with corresponding FISH data. The tumor specimen on the top was taken from a pre-menopausal woman with stage IIb IDCA, without amplification of the HER2 gene. The tumor specimen on the bottom was taken from a pre-menopausal woman stage IIIB IDCA and HER2 amplification of 3.3. Green signals = CEP17 probe, orange = HER2. Microsatellite markers were amplified as previously described , purified using Sephadex G-50 resin and genotyped on a MegaBACE-1000 capillary electrophoresis apparatus (Amersham Biosciences, Piscataway, NJ) following standard protocols. Genotypes were determined using Genetic Profiler version 2.0 software. AI was detected as previously described  using a cutoff value of 0.35 (Figure 2), which provides >80% reproducibility when AI events are confirmed on a second aliquot of DNA . Detection of allelic imbalance in a HER2+ breast tumor with fluorescence-based genotyping. Alleles for marker D17S250 on chromosome 17q12 were detected as fluorescent peaks in reference DNA (top panel) and microdissected breast tumor DNA (bottom panel). A normalized peak height ratio of 0.28 was calculated for the tumor sample using the following peak heights in relative fluorescence units (rfu): tumor DNA – 8,791 rfu and 30,585 rfu, referent DNA – 61,195 rfu and 59,934 rfu. To increase the ability to detect AI, two microsatellite markers from each chromosomal region were assayed. Marker information was then pooled and AI at each chromosomal region was defined as follows: 1) when at least one marker for a given region showed an allelic ratio ≤ 0.35, the region was considered to show AI; 2) when neither marker had an allelic ratio ≤ 0.35 and at least one marker was informative, the region was considered normal; and 3) when both markers were homozygous, the region was considered uninformative. Comparison of the clinicopathological factors and levels and patterns of AI by HER2 status were performed using Mann-Whitney and Fisher's exact tests. Potential confounding factors were investigating by computing the significance of partial correlations between HER2 and AI while holding grade and ER constant as mitigating factors. Correlations were calculated non-parametically from the 2 by 2 tables for ordinal scores (using Phi coefficient of association) and then a direct application of the partial correlation calculation was conducted. P-values were estimated from the non-parametric partial correlation using parametric assumptions to attempt to indicate if true correlation was observed. A significance value of P < 0.05 was used for all analyses. In total, 181 samples were included in this study. All samples were collected from female patients; 22% (n = 39) were HER2+. While age at diagnosis, lymph node status, tumor histology and stage did not differ significantly between the two groups, poor differentiation and hormone receptor negative status were observed significantly more frequently in HER2+ compared to HER2- tumors. Ninety-four percent of HER2 amplified samples had IHC scores of 2+ or 3+. Of the 39 HER2+ tumors, six were from patients diagnosed with invasive breast cancer prior to 1998, thus treatment with trastuzumab was not available for these patients. Of the remaining 33 HER2+ patients, ten were treated with trastuzumab (Table 2). Four HER2+ patients have died of disease and three have developed distant metastasis. The large number of specimens collected within the last 5 years precluded the analysis of outcome data in this study. Median AI levels were 25% (range 0–80%) and 13% (range 0–67%) in HER2+ and HER2- tumors, respectively. Levels of AI were significantly higher (P<0.005) in HER2 amplified (mean = 27%) compared to HER2 negative (mean = 19%). When stratified by chromosomal region, AI events were detected significantly more frequently in HER2+ tumors at 11q23, 16q22-q24 and 18q21 (Table 3). No region was altered at significantly higher levels in HER2- tumors. Because ER status and tumor grade have been associated with HER2 status and may confounding the relationship between HER2 amplification and AI, partial correlations were calculated at each chromosomal region between HER2+ and HER2- samples, holding ER status and grade constant. While the correlation between AI and HER2 status at chromosome 11q23 was influenced by grade, three chromosomal regions, 11q13.1, 16q22-q24 and 18q21 showed significant correlations with HER2 status that cannot be explained by either ER status or grade. The development of trastuzumab has been cited as a successful example of pharmacogenomics where treatment choices are personalized to individual patients based on specific tumor characteristics. Not all patients with HER2+ tumors, however, will benefit from trastuzumab, and given that the cost of trastuzumab ranges from $20,000 – $80,000/year with potential side effects including fever and chills, gastrointestinal toxicity, myelosuppression, and cardiotoxicity with heart failure , more precise prediction of which HER2+ patients will derive benefit from trastuzumab and improved understanding of how amplification and/or overexpression of HER2 contribute to aggressive tumor biology are critical to improving patient treatment. In addition to the high levels of overall genomic instability associated with HER2 amplification, the positive association between chromosomal alterations at chromosomes 11q13.1, 16q22-q24 and 18q21 and HER2 amplification suggests that genes in these regions may contribute to pathogenesis of HER2+ tumors. Bertucci et al. identified a 36-gene expression profile of HER2+ breast tumors which included altered expression of genes chromosomes 11q and 16q, including the fatty acid desaturase 2 (FADS2) gene [GenBank: AF084559] on chromosome 11q12.2 and the M-cadherin (CDH15) gene [GenBank: D83542] on chromosome 16q24 . Deletions of chromosome 18q have been associated with poor survival . Loss of chromosome 18q has been associated with amplification of HER2 as well tumor progression and poor prognosis [27, 29, 30]. Thus, chromosomal alterations at these regions may contribute to the aggressive pathology and poor prognosis associated with HER2+ tumors. Because the HER2 gene is located within one of the 26 regions in our AI panel, patterns of AI at 17q12-q21 were examined. 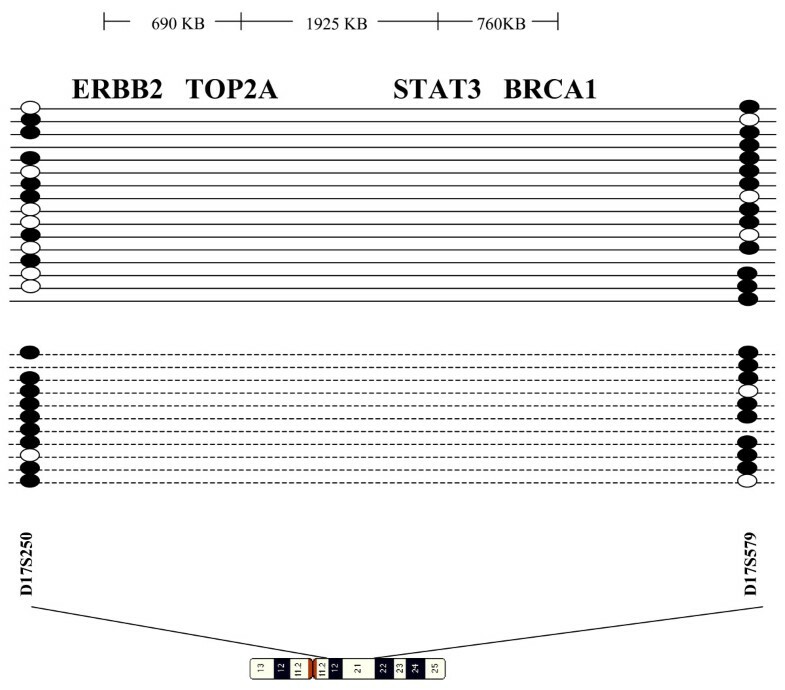 The two markers used to assess chromosomal content at 17q12-q21, D17S250 and D17S579, define a 5.7Mb region that includes not only the HER2 and TOP2A genes but also the signal transducer and activator of transcription 3 (STAT3) and breast cancer 1 (BRCA1) genes (Figure 3). In samples with AI at chromosome 17q12-q21, the majority of HER2- cases had AI at either D17S250 (24%) or D17S579 (59%), while in 50% of HER2+ tumors, AI was detected at both markers, suggesting that multiple genes from the 17q region may be altered in HER2+ tumors. Schematic diagram of the 17q12-q21 region. Genes involved in breast cancer are listed across the top, with distance between genes noted. Patterns of AI are as follows: solid line = HER2- tumors, dotted line = HER2 amplified. Black circles represent an AI event, white circles, normal chromosomal content. Where there is no circle, the reference genotype was homozygous, and thus uninformative. TOP2A alterations may contribute to pathogenesis in HER2+ breast carcinomas by altering sensitivity to anthracyclines . Increased expression of STAT3, which may alter cellular proliferation, angiogenesis, and apoptosis, can be activated by HER2 [32, 33], and has been associated with advanced disease and poor response to chemotherapy , thus genomic amplification of 17q12-q21 may increase STAT3 levels and contribute to aggressive, refractory breast disease. Although mutations in BRCA1 are uncommon in sporadic cancers, physical loss of BRCA1 has been detected in ~50% of sporadic tumors. BRCA1 deletions may be attributed to the genomic structure of BRCA1, which is characterized by unusually high numbers of Alu and non-Alu repetitive sequences . During replication, mis-pairing between repetitive elements can lead to large deletions in the BRCA1 gene region . How the unstable genomic structure of BRCA1 affects HER2 is unknown, however, because BRCA1 is a DNA repair enzyme, deletions of BRCA1 may impair cellular DNA repair, leading to an accumulation of DNA damage across the genome. In conclusion, breast tumors with copy number changes in the HER2 gene show higher levels of overall genomic instability. Alterations at chromosomes 11q13, 16q22-q24 and 18q21, all of which have been associated with aggressive tumor behavior, may serve as genetic modifiers to HER2 amplification. In addition, alterations within and across the 17q12-q21 region, including TOP2A, STAT3 and BRCA1 may modify the effects of HER2 amplification. Future studies to identify the gene alterations associated with HER2 amplification as well as examination of a larger group of HER2+ patients treated with trastuzumab should improve our understanding of HER in breast pathogenesis and allow more accurate risk profiles and better treatment options to be developed. The authors thank Dr. Christopher M. Gallagher for critical evaluation of the manuscript. This work was performed under the auspices of the Clinical Breast Care Project, and supported by the United States Department of Defense (Military Molecular Medicine Initiative MDA W81XWH-05-2-0075). The opinion and assertions contained herein are the private views of the authors and are not to be construed as official or as representing the views of the Department of the Army or the Department of Defense. JAH performed all pathological characterizations, BD performed FISH analysis on all specimens, HP carried out the genotyping experiments, studies, BL oversaw all statistical analysis, DLE and CDS contributed to the preparation of the manuscript and REE conceived of the study, and participated in its design and coordination and helped to draft the manuscript. All authors read and approved the final manuscript.